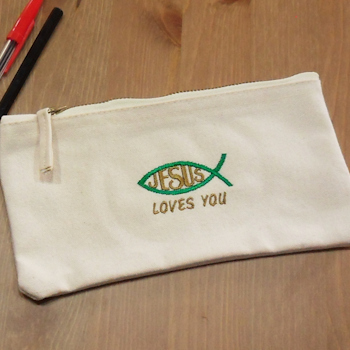 Ichthys Jesus Fish symbol embroidered cotton pencil case. Ichthys Jesus Fish symbol embroidered cotton pencil case. Personalised with a little name or words of your choice under the Jesus Fish (in place of the Loves You line). Select the thread colours you want! Ichthys Jesus Fish symbol embroidered cotton pencil case. Personalised with a little name or words of your choice under the Jesus Fish (in place of the Loves You line). Select the thread colours you want! Our example is in gold and green. Sturdy natural canvas pencil and pens case. Use as a school pencil case, cosmetics case or little arts and crafts case, ideal for Sunday school! This natural canvas case is made from sturdy cotton and has a robust metal zip along the top. Case measures 20 x 11cm.